Come to Peace Ridge and enjoy a fabulous day of compassion! Celebrate the fall harvest in the company of friends and family to benefit our farmed animal residents and enjoy a different type of holiday tradition where animals are beloved friends, not food. 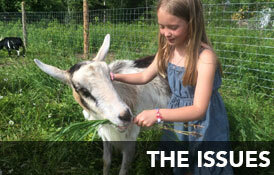 Together we will enjoy time with the animals and an incredible vegan holiday feast! - Sanctuary tours & meeting our animal residents. - Delicious vegan appetizers, gourmet meal, & dessert. - Complimentary wine & beer (for those 21+) & nonalcoholic drinks. - A presentation about all the exciting things happening at PRS. - Live music, and more! Guests are welcome to bring fruits and vegetable for the animals to enjoy - please note we do not allow our animals to eat spoiled food, so anything you bring should be fresh. For your safety as well as the safety of our animal residents, visitors will not be allowed to feed animals. Any donated food will be collected by caregivers to distribute to the animals throughout the week. Please drive very slowly up the driveway as there are often free-roaming birds and other animals. There are a limited number of tickets available. Advanced purchase is required before the event and tickets are expected to sell out, so reserve yours early! *This is our largest fundraising event of the year. While we offer many low & no-cost events throughout our June-November visiting season, this event brings in valuable funds as we go into the harsh Maine winter. If this event isn’t within your budget, we hope you’ll visit us at another event soon! **This is a family-friendly event and children are more than welcome. There is no charge for infants who will be sitting in your lap, but for children who will be taking up a seat, purchasing a ticket for them is required.